Preliminary results for the month of April saw a total of 106 commercial auctions collected, with a preliminary clearance rate of 82.1% over the month. The preliminary commercial auction results were more subdued in April relative to March. March preliminary results saw a higher number of auctions held (158), with a clearance rate of 91.8%. According to the preliminary results in the same month of the previous year, there were a higher number of auctions held (185), but the clearance rate was much lower at just 50%. At $156 million in April 2016, the combined sales value figure were approximately 17% lower than the $183 million result collected in April 2017. The lower auctions listings against a higher clearance rate and sales value suggests there is an increasing demand against limited available stock. 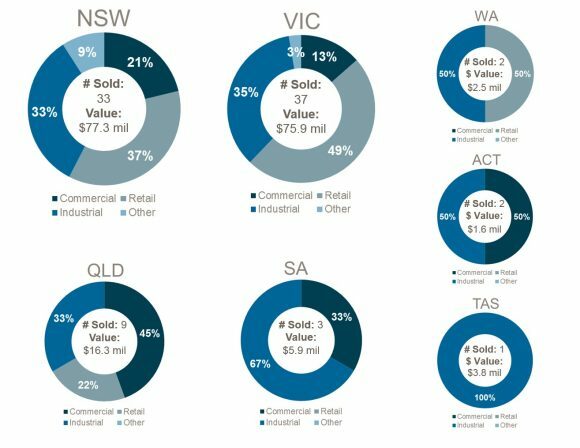 Below is a summary of the commercial auction results by state. The highest number of auctions was in Victoria, at 37 sold commercial properties, followed by New South Wales. Most of the Victorian sales were in the Melbourne Metropolitan, Victoria saw some retail sales in Geelong. In New South Wales, many of the sales were on the fringe of the metropolitan, as well as in more regional areas such as Ballina and Tamworth. The prominent share of retail sales in both states speaks to the continued strength of this market segment. While the decline of the department store results from the rise of cheap online shopping, boutique retail, as well as café, restaurant and take away food remain popular. This is unsurprising given the relatively strong growth in household consumption in these states, and the rise of overseas tourism that results from strengthening incomes in the Asia Pacific Region.